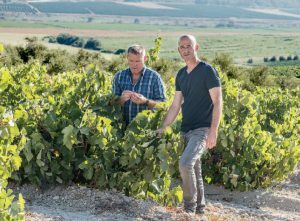 Three winemakers who are bottling Israel’s vinous history. “Is that the wine that Jesus drank?” This is the near automatic response I receive whenever I express enthusiasm for wine made from Israel’s native grapes. But my geek-like fascination is not unfounded. Although modern winemaking in the country tends to focus on transplant French varieties, like Chardonnay and Cabernet Sauvignon (Baron Edmond de Rothschild of Bordeaux’s Chateau Lafite brought over plantings in the late 19th Century), a small group of winemakers have now gone back to the country’s viticultural roots. Some of these specimens are not only native to the land and country; they’re also very old. Ariel University researcher and oenologist Elyashiv Drori has found references to the white grapes Jandali and Hamdani (also known as Marawi) in the Babylonian Talmud dating back as far as 220 A.C. Now, those grapes are slowly making their way into the portfolios of Israel’s wineries. In a place that has antiquity in its DNA, why, I’ve often wondered, was this history ignored for so long? 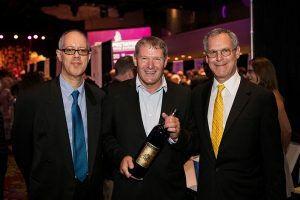 As an impressionable young sommelier in February 2012, I traveled to Tel Aviv for IsraWinExpo – the country’s largest wine trade show. I was certain the tasting would be filled with local grapes I didn’t know—Israel’s equivalent of Greece’s Assyrtico or Lebenon’s Merwah grape. Yet I left deflated. Winemakers eagerly extolled their new French oak barrels and international blends. My inquiries about local grapes were met with a seeming sense of shame. The wines I tasted felt a little like imposters: made in Israel but not necessarily from here. The wine is low in alcohol (around 12 percent) with vibrant acidity, ripe melon and pear flavors and a rich, textural mouthfeel from aging eight months on the lees. The newly bottled 2015 tastes even fresher, its green melon notes and wooliness reminiscent of Chenin Blanc. The label displays the grape’s name in both Hebrew and Arabic – a subtle hint at its border-crossing origins. Further inland at Cremisan Wine Estate, head vintner Fadi Batarseh is no stranger to these sorts of geographic complexities. 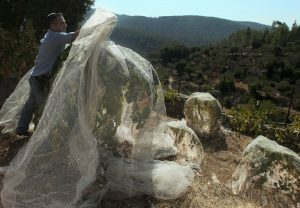 The winery, associated with a Christian monastery, is located in the Israeli occupied West Bank. 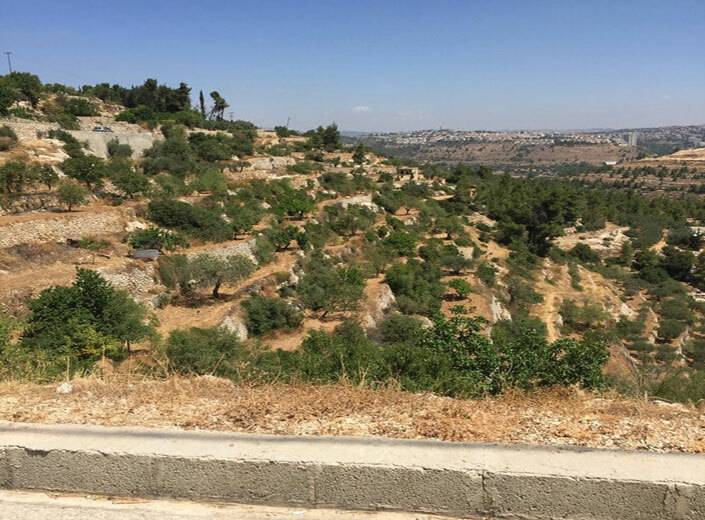 Its property – dramatic rock terraces studded with olive trees and grape vines—lies in what is now considered Bait Jala, Palestine, but that could change with the political tides. Batarseh had previously written his thesis on the native grapes of this land while studying oenology in Trento, Italy. In 2007, he paired up with famed Italian oenologist Riccardo Cotarella to start Cremisan’s Star of Bethlehemseries. “The project focuses on the idea of origin,” he says. 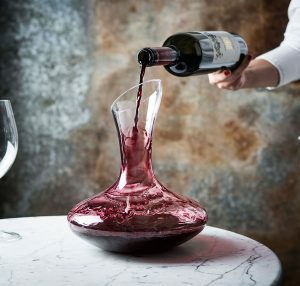 “We have this unique opportunity not to only be in Holy Land but also to make wine from its original grapes.” One wine from the series, a 2013 Baladi, was the only native red that I encountered. It had plush plum flavors that could rival the best northern Italian expressions of Merlot, accented with Syrah-like coffee notes. Their fifty-fifty blend of Hamdani (Marawi) and Jandali that I tasted next shared a similar green melon note with other Marawi wines but with an extra mintiness and punch of acidity, which could be the hallmark of the even rarer Jandali grape. True terroir expression—not just of the local soil and climate, but also the local history—was something these winemakers all seemed to be after. And, tasting the wines, I think they’ve found it. 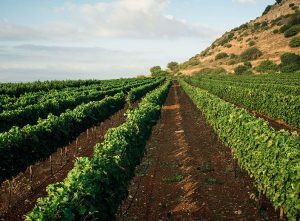 Israel’s wine industry is amidst its most important awakening in thousands of years.